Last december, Amazon added a simple button on its Kindle device. 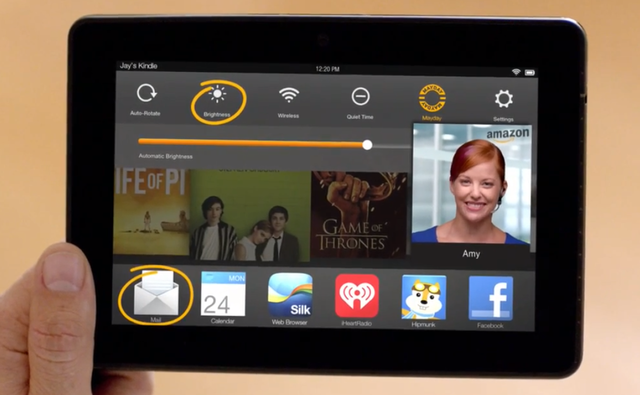 The MayDay button, as they call it, allows Kindle users to live video chat with a customer service representative. The rep can also draw on the screen or co-browse to help the user go where he wants. What’s great about MayDay is that it is accessible to ALL Kindle owners. There’s no premium or « best customers only » access. Amazon provides high standard service for EVERYONE. Amazon is not kidnapping your customers, tying them down and forcing them to buy from them. They just listen to them, and are here to help at anytime (the MayDay button works 24/7). They started with their Kindle device but might extend the service to their online marketplace in the future. Other customer centric companies will then follow, making video chat the new norm of customer service and stealing huge market shares in the process. Salesforce just announced an SOS button, very similar to what Amazon does. With all Salesforce clients about to enter the market, video chat will become a hit even earlier. Why customers like live video chat support? And contrary to what many are saying, they don’t like to do everything themselves. Lately it feels like brands got the ideas that customers LOVE doing everything themselves. It’s just self service everywhere! It came to the point that it can be really hard to find the company’s contact info. While a degree of self service is essential, it doesn’t mean your customers don’t need human customer service. Customers are not big fans of offshored call center. There’s often a language or cultural problem and it makes them feel like they are not really worth the company’s time. With video chat they can feel like they’re talking to a local store employee. It allows your brand to create a better relationship with customers. When browsing a website it’s sometimes easy to forget that you are actually reading something a person created and that there’s a whole team working hard to keep the website running. Internet shopping lost a big part of the emotional connection brick and mortar shops have with their clients. Here’s what Amazon CEO Jeff Bezos says about MayDay: «It’s actually very similar to having someone standing next to you ». The thing video chat does best is to erase the distance there is between 2 people. It works for online dating and there is no reason it shouldn’t work for your customer service. Did you know that most people have what is called a visual memory ? Memory goes together with comprehension which means that the majority of the population understands better and faster when there’s a visual element. In most cases it will actually take less time to settle an issue (especially a technical one) using video. Devices like the Kindle or a computer are not made to call which means that you have to « leave » the website and get your phone to contact customer service. With a button like MayDay you can keep browsing while talking to the customer service representative. Most of the time customers won’t even turn their camera on, but will be able to see the agent and talk to him. One of the main concerns customers have with video chat is that they will be seen. It requires an effort in presentation that they are not always comfortable with and it’s impossible to blame them. Amazon chose an approach where representatives can see only the customer’s screen and not his face. Knowing that screen sharing can be disabled at any time. The big advantage of video chat is that it can actually be « customized » to turn into a voice chat if needed. Some services even offer text chat like Skype does, therefore providing online stores with 3 ways of communication into one product. Amazon is a customer centric brand, that’s not new and that’s one of their strenghs. Most customer centric brands have one thing in common : They provide all their customers with high standard customer service. You might think that if everyone is treated the same, no one will actually feel special but in reality it doesn’t really matter in the online world. The main thing is that your customers can’t really compare their experience with what others get right away. They are actually more likely to compare your service to what they got elsewhere. In that case, having a competitive advantage like video chat makes sense as it is something they won’t find with your competitors. Imagine how special it makes them feel to know that they have someone’s full attention and that the representative even takes time to video chat with them. That’s what excellent customer service is all about. It’s treating every problem like it’s important and focus on making the customer happy instead of focusing on productivity first. Customers are not used to see customer service on video yet and you can still surprise them by just offering the option. The amazing thing with pleasant surprises is that the word about it spreads a lot faster. By including the information about video chat in the tweet she spikes her followers’ curiosity. Amazon is now selling a buying experience in addition to a product. When you know that 81% of shoppers are ready to pay more for a better customer experience, it opens a whole new door. What if the value of your brand wasn’t so much in your product but more in your customer service ? When you look at it like that it makes a lot of sense to invest in new forms of communication. Adding video chat has a cost that you can actually cover by « selling » a better customer experience. We know that most companies don’t have the bugdet to developp a new video chat customer service solution by themselves. That’s actually why we developed Customericare. Brands should focus their time on improving their product and the heart of their customer service. We can’t define your brand customer service values but we can give you the tool to achieve excellence. Our video chat solution is designed for online brands that are looking to enhance customer experience. We believe video chat is the solution of the future and seeing what Amazon and Salesforce are doing, we are not the only ones. Just don’t wait for everyone to start video chatting before you and be an early adopter today ! What do you think? Is video chat the future of customer service or will customers always prefer to call? Share your thoughts and personal experience in the comments!